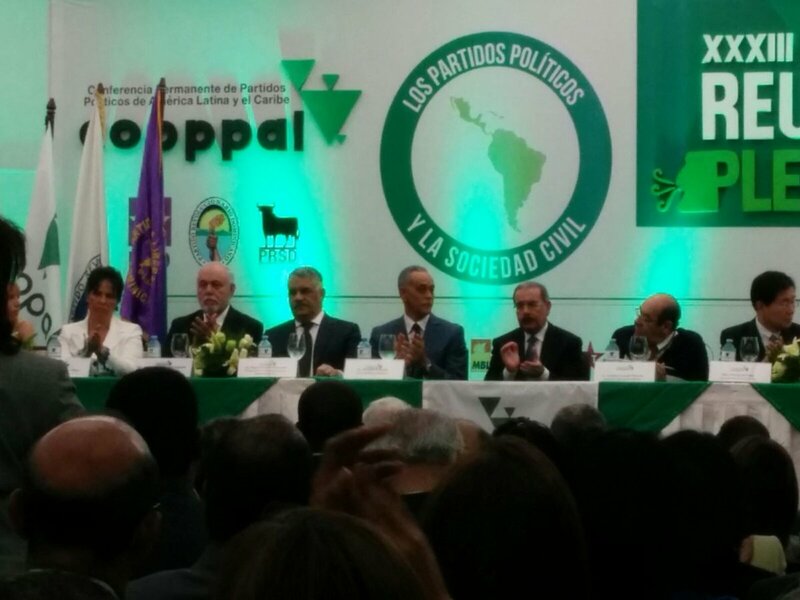 The Permanent Conference of Political Parties of Latin America and the Caribbean (COPPPAL, Conferencia Permanente de Partidos Políticos de América Latina) is an international forum of nationalist political parties in Latin American and Caribbean countries. Founded in 1979 and headquartered in Buenos Aires, Argentina, the organization currently comprises 57 political parties from 28 countries. The full list of political party members can be found on the organization's Wikipedia page. Interestingly, it also includes nationalist parties from Bonaire (Bonaire Democratic Party), Canada (Parti Québécois), Curaçao (Frente Obrero Liberashon 30 Di Mei 1969 - Partido Laboral Krusada Popular), and Puerto Rico (Partido Independentista Puertorriqueño). The flag of COPPPAL features the organization's logo centered on a white field. The logo itself consists of four, green, isosceles triangles. The largest represents South America, with a smaller one representing Central America connecting at the upper left corner. A smaller triangle lies in the space to the right of the first two, representing the Caribbean members, while the smallest triangle is at the bottom of the logo and represents the islands off the tip of South America. Below the triangles is the organization's acronym in rounded, black, lower case letters. The flag can be seen hanging from a pole in the background on the left-hand side of a photograph online here.